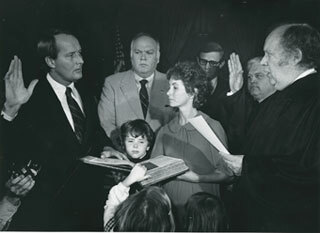 The Alexander Papers consist of the personal papers of Lamar Alexander, 45th Governor of Tennessee, senior Unites States Senator and Conference Chair of the Republican Party, and Leslee “Honey” Alexander, from 1955-2000. This includes the senator’s work on the Howard Baker campaigns, Richard Nixon presidential campaign, and Winfield Dunn campaign, items from his time as news commentator, his 1974, 1978, and 1982 gubernatorial campaigns, his governor’s papers, manuscripts of his books, and records of his 1996 and 2000 presidential bids. Highlights of the collection include video, transcripts and correspondence surrounding Alexander’s 1979 early swearing in after members of the Blanton Administration were under investigation by the FBI for selling pardons to prisoners. Photographs of the filming of Marie, the story of Marie Ragghianti who alerted the FBI to the “clemency for cash” activities, are also part of the collection. Paperwork and photographs show how the governor’s administration built strong relationships with Nissan and Saturn that led to the development of the automobile industry in Tennessee. Alexander’s efforts to improve state education standards through the Better Schools and Master Teacher Programs are documented as are his later work as President of the University of Tennessee (1988-1991) and as U.S. Secretary of Education under the George H.W. Bush Administration (1990-1993). Correspondence and photographs with Senator Alexander’s close friend and Roots author Alex Haley tell the story of Haley’s involvement with Homecoming ‘86 as well as the two men’s voyage on a cargo freighter while Alexander completed his book, Six Months Off. 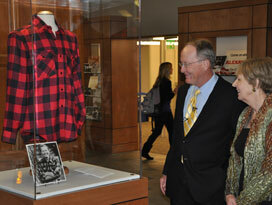 Photographs of Music City celebrities such as Sarah Cannon (aka Minnie Pearl), Johnny Cash, Jerry Reed, Charlie Daniels, and Roy Acuff are part of The Alexander Papers, as are images of the first family at home in the Governor’s residence. These latter photographs paint a picture of what life was like for the young family over two terms of office.